It was some bad luck that followed this "Schwarzenegger from Ukraine," Pisarenko's nickname by the media overseas. At the 1980 Olympics, he was too young and the coaches preferred to go with more experienced and known lifters. At that time in Moscow, Sultan Rakhmanov who already held the championship title was paired with legendary Vasily Alexeev who was about to leave the world competitions. Pisarenko was told to wait. "Your time will come!" In 1984, the Soviet sportsmen didn't go to Los Angeles due to the reasons independent of their will. The Olympics boycott left many of the Soviet athletes without medals. Pisarenko was one of them. Pisarenko wanted the Olympics medal. He was ready to stay atop of the elite world lifting for another four years. But all his hopes were stopped by disqualification. As a result, the Summer Olympics in Atlanta became his first Games. 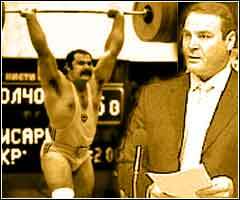 Pisarenko attended that Olympics as the president of the Ukrainian Weightlifting Federation. And now it's Sydney where he is ready to lead his countrymen again. He arrived to the Hotel Sports in Kiev on his new Jeep. The 42-year old man with moustache didn't look like the guy who failed to win the Olympics - more like a Ukrainian Cossack from the old famous painting. I told Pisarenko that if I were a director of commercials advertising national cosine, he would have definitely got a part. "And why not for the commercial of lobsters, oysters and caviar?" Replied "New Ukrainian" with a smile and offered me to visit the sea boat that he owns. Time cures old pain. Do you still think about the Olympics you could have won? A little bit... In 1984, I ought to win the Olympics. All laws of physics were for that. I earned that medal. And I don't have it. The politicians took it away from me. Imagine my feelings when after I won the alternative Friendship Cup in Varna with 465 kg total and then found out the some guy from Australia won the Olympics with these ridiculous 412.5 kilos. He lost over 50 kg to me! But he was an Olympics champion and I was not. It hurt. Did you have any chances to compete in Moscow four year before? In 1980 I was young. Only a year later I broke records by Sultan Rakhmanov and Vasily Alexeev who won the ticket to Moscow. I have to tell you that all three of us were selected to the pre-Olympics camp and I wasn't the worst in that trio. To say more, in both lifts, I was 10 kilograms ahead of Rakhmanov. Not to mention Alexeev. But the national team coaches said that I am not ready. Maybe, the difference in size mattered too. Rakhmanov's bodyweight was 150 kilos, Alexeev's - 185. Add to this all the titles they had. 79 world records by Alexeev were impressive. My weight was only 114 kilos. So, they "outweigh" me at that time. By the way, both of them skipped the USSR national championship held before the Olympics. Vladimir Marchuk who broke into the weightlifting elite for a short period of time won the tournament. No one paid attention to that tournament. It had been decided already who had to be at the Olympics. In the end, you proved that the outstanding super heavyweight didn't have to be a monster-like figure frightening his opponents by his size. And, to tell you the truth, it was the main reason for my sports career. Why didn't you come back to weightlifting and prepare for the next Olympics after your 2-year long disqualification was over? Strangely enough, the main reason was my over zealousness. After that break in my career, I began to lift very fast. But the readiness was misleading. My body wasn't ready for heavy training - I injured the muscles of the hips. Nowadays, I can say that that I had to stop, had to wait another six months, get well and only then slowly get into the training cycle. But I decided to change my life at once. At that time, you had three world titles. Didn't you feel sorry that your Olympics dream wasn't coming through? When I left weightlifting, I was disappointed. As if I failed in the lift attempt. You have another attempt. The referee calls you and you know that you will not go to lift anymore. I hurt but what can you do? It is important to leave with dignity. Leave when you leave. I remember Alexeev once said when he saw me training "This guy will either die in the gym or break himself." And there was a wild jealousy in the way he said it... He could have just wished me luck the day before I broke three world records. What helped you to break in into the circle if elite athletes? If I say hard work, it won't be true. It's not enough. I met many hard working people in the gyms, but only a few became world champions. On the weightlifting platform your physical strength has to be multiplied by you intellectual abilities and ambitions. Don't confuse our sports with a forced labor. I always consciously approached whatever I was doing. Believe me - I never lifted anything heavy in my life but the weights. My wife tells me in the airport "Grab a suitcase!" I just reply: "For what? There is a person who gets paid to do that." It's a different job. I was doing something different. Did you have a complex of inferiority competing with the athletes whose bodyweight was 100 lbs more than yours? Never. I have to tell you I always liked athletes without intimidating sizes. Those are Suleymanoglu, Zakharevitch, Vardanyan. Unique athletes. What weight we could have expected you to lift had you not leave the sports? My records were far from my max. I snatched 206 and in the training was ready for 210. I cleaned and jerked 265 kilos and I was lifting 270 in the training. I jerked 260 on two reps. The experts were saying that potentially I was ready for 280 kilos. By the way, I cleaned 280. Are you doing any sports today? I play tennis, do scuba diving, skiing... I am very comfortable riding the horses. I just love it! When I was younger I was getting offers to do shot put or discus throws but I preferred the weightlifting. Tell us about what happened many years ago in Toronto when you and another outstanding athlete Alexander Kurlovitch were arrested in the airport? We were arrested while carrying medications that were considered as banned doping substances. At first, we were banned from sports for life. Although, we didn't deserve such a strict verdict. Did you fulfil yourself in sports? No way. My ambitions were huge. Nowadays I do everything I can so that my name and administrative talent work effectively for the Ukrainian sports overall and weightlifting in particular. Otherwise, I would have never become the president of Ukrainian Weightlifting Federation. What are your relationships with the great ones - Vlasov, Zhabotinsky, Alexeev, Rakhmanov? Are you keeping in touch with them? My relationship with Alexeev didn't work from the very start. He was supposed to become my coach. Vasily began to force me to re-learn lifting technique. We disagreed right there. So, I was his student exactly during one training session. It's a sad and funny story of two characters that couldn't co-exist together. When I first met Yury Vlasov, I was very impressed. I recognized a real intellectual right away. Although whatever he's writing doesn't interest me. It doesn't sound like a real life in sports. Most often, I spoke to Leonid Zhabotinsky. As far as I know, he now works in one of the Moscow universities. He is a great guy. No show off. Very real and down to Earth. He is probably the closest to me the way he is. And, finally, Sultan Rakhmanov. I would call him a big baby. He should be grateful that he got into sports at the right time. Alexeev was leaving into shadow and talented lifters of the new wave were not ready yet. It shouldn't diminish Rakhmanov's success at the Olympics in Moscow. He won over the best of the best. Today Sultan is very sick. His weight is over 450 lbs. When he turned 45, I presented him a Lincoln. I didn't go to celebrate his 50 though. Did you have a hero among the legendary athletes of the past? No. I didn't accept any "untouchable" authorities. I had alot of respect for David Rigert, Vasily Alexeev and some other athletes. But they were not my heroes. You did alot for weightlifting in Ukraine. You created a lifting center, bought equipment worth hundreds of thousand dollars, provided lifters with medications and food supply. There are many things now that Team Ukraine has which even great Soviet team didn't have. What is your reason in investing your own money into this? "Reason" is not a right word for this. It will make me happy if Gotfrid, Razorenov or Udachin (he broke three world records at the world championship among juniors) will win gold medals in Sydney. But most important, it will make the fans happy. That is important to me. Don't overestimate my resources. I can't resolve all the issues for the Ukrainian weightlifting. But I did something for sure. For example, I brought Peter Alaev back from Syria. He is an ex coach of world champion and record setter Viktor Sots. He has a huge experience and literally encyclopedic knowledge of our sport. He builds the training process on a cutting edge methodology. He uses computer technologies for developing of individual requirements, nutrition, recuperation for each athlete. If I had a coach like this, I would have passed 500 kilos in total even today. During your era in sports, there were rumors that you decided to increase your bodyweight by 30 kilos - so, that you could set the records for eternity. Is it true that only a "complex of a bodybuilder" didn't let you do this? Hey, even with my low bodyweight, I was a world champion. You can call it any complex you want, but it just look more appealing to have a guy with a beautiful figure on the platform, than some dude with a huge belly. I do feel more kinship with Schwarzenegger than with the shapeless Paul Anderson, the classics of American weightlifting. Why do you think US lifters lost their leadership in Olympic weightlifting? I would compare American weightlifting with their own American limousine car - super luxury car with powerful engines and first class gas... Do you know how much is the budget of US weightlifting federation? Three million dollars! It's silly to compare their budget with the one in Ukraine and Russia. But it's us that are leaving for Sydney to compete for medals. Not them. The main reason is that top-notch limos need to be driven by top-notch drivers. Why did you switch from sports into the business field? I wanted freedom! Not that freedom that the Soviets were giving to us - if you behave yourself, we'll send you for tourist trip abroad. Not that one! You can really feel free when you have money. And also when you have a power... For example, I want the NOC of Ukraine to become an independent enterprise not some part of a state committee. And an energetic person should lead it. Unfortunately, it is still like it was before. We decided to create our own Olympic bank and sports federations put their money into this bank. And what happened? No money, no bank. We got Samsung as a sponsor and got some ridiculous amounts. And the same goes everywhere. Does it mean that had you been the NOC President, things would have gone differently? I know how to manage my own money. Trust me, I would not waste a penny. How about Alexander Kurlovitch? Was his decision to get involved in politics inspirational for you? Nah. I feel more comfortable in business than in politics. By the way, Karelin just told me that when he was young he collected my pictures, wanted to be like me. Isn't it the nicest thing to hear from one of the all-time greatest athletes? Videos and Gallery of Anatoly Pisarenko is available in his section of the Hall of Fame @ Lift Up.